When traveling in Central America, sink your teeth into the Caribbean’s newest delicacy to help protect marine life from a dangerous predator. Restaurants in Belize, Costa Rica, Honduras, Nicaragua and elsewhere offer a variety of dishes featuring the exotic-looking lionfish, an invasive species that’s wreaking environmental havoc in tropical Atlantic waters. Native to the South Pacific and Indian Ocean, lionfish became an eye-catching showstopper in home aquariums because of their colourful vertical stripes; broad, fan-like fins; and tall dorsal spikes, which happen to be a venomous defense mechanism. Before long, however, many aquarium owners lost interest, including some in South Florida who dumped them into local waterways in the mid-1980s. In no time, the mesmerizing fish found their way into the Gulf of Mexico and Atlantic. With no predators in its new habit, the species spread exponentially, reproducing quickly and devouring native species. Voracious eaters, they prey upon over 70 species of fish and crustaceans and outcompete local fish for food and territory. 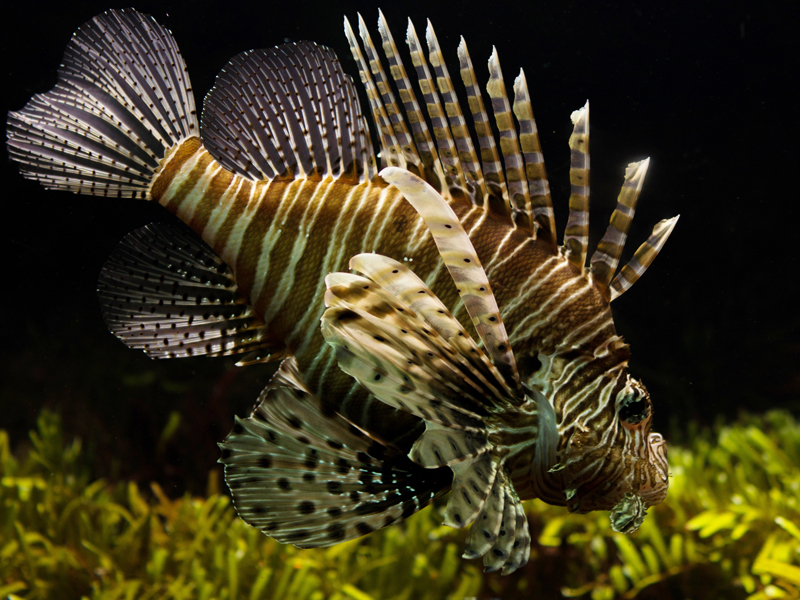 In heavily infested locations, lionfish have reduced native species by up to 90 percent. To the human palate, however, lionfish tastes delicious! Often compared to snapper for its flavour and flaky texture, lionfish can be served whole fried, pan seared, breaded, grilled, blackened or as ceviche and tacos. It’s good for you, too, loaded with heart-healthy, omega-3 fatty acids, and it’s low in metals like mercury and lead. Dozens of recipes are listed in the Lionfish Cookbook: The Caribbean’s New Delicacy, published by the Reef Environmental Education Foundation in the Florida Keys. Bermuda led the way in promoting lionfish as a dining option, launching its “Eat ‘Em to Beat ‘Em” campaign in 2007. Other island nations and coastal countries adopted similar efforts, which urge restaurants, wholesalers, and fishing communities to promote the savoury menace as a meal. Catching lionfish, however, represents a challenge, as they don’t typically bite hooks. Nor do cast nets work, because lionfish hang out amongst corals and rock formations, not in open waters. Divers use spears or hand nets to bring them in. If your Central America vacation includes coastal or island pursuits, look for a “lionfish derby” or other lionfish-collecting festival during your stay. Restaurants, marine parks, and environmental groups frequently organize festive contests, offering prizes to divers for bringing in the most or the biggest lionfish. The non-fishing public at the events can enjoy lionfish samples, cheer on the divers as they return with their catch, watch the scoring, participate in cooking demonstrations, and more. The day’s haul goes straight to local restaurants. Meanwhile, experts are working on larger-scale ways to reduce the lionfish population, including a robotic undersea vacuum, submerged traps, and even trying to encourage sharks, eels, and other native species to feed on lionfish. With millions of lionfish out there, it’s a matter of making a dent where it counts along sensitive coral reefs, not wiping them out — at least not yet. If you see lionfish on the menu during your Central America travels, do your part, deliciously! *Gordon Ramsay Hunts For Lionfish To Cook & Jamaican Lionfish, videos used in this article are not Viaventure’s property, they had been originally published in Youtube.